Do you also find it curious that nowhere on your package of razors or razor blades does it state how long a razor blade should last? Although the shaving company might argue that a razor's longevity is predicated on how it is used, I might argue that they do it because people don't tend to keep razor blades as long as they could. 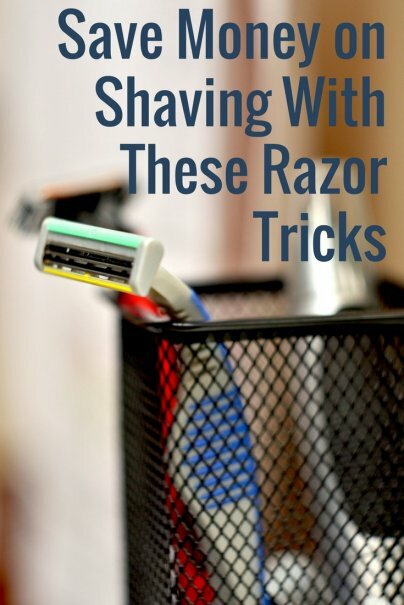 Here are some ways you can save money on shaving with these razor tricks. One of the most popular theories about the life of a razor blade is that dullness is a result of oxidation, not use. When water sits on the razor blade between shaves, corrosion will make the metal flake off, and the blade itself can become either blunt or jagged. Exactly how people choose to dry their razors varies, and there are even products on the market to help you (but if you have to buy something to dry your razor and make it last longer, you are probably not being frugal). Although it is a pig on power, using a blow dryer will help you to ensure that even the spaces between and behind the blades get dry. You can also blot the razor dry on a towel. Be careful of cutting or otherwise wrecking the towel — or your hands — in the process though. Be sure not to rub the razor; just blot dry. When using either of the above methods, first give the razor a rigorous shake to eliminate all the excess water. Not only water, but oxygen in the air plus the salt from your skin will contribute to a razor's quick demise. So not only drying but also coating your razor can protect it from the water, oxygen, and corrosion that dull the blade. Soak vs Dip: Some people advocate soaking the razor in a cup or vial filled with the substances below and storing it this way between shaves, while others indicate that a quick dip will do everything necessary to coat the blades and preserve the razor's shelf life. This dissipates the water, encourages drying, and sanitizes the razor for an extra benefit (especially if you are prone to acne problems). Mineral Oil — This seems to be one of the most effective oils to use, as it is also good for your skin. Grape seed/Almond Oil — The cost-conscious might want to use a mixture of these oils instead of mineral oil, which can fetch a specialized price. Baby Oil — I read about a fellow who actually used baby oil after running out of mineral oil (in an attempt to save money), and apparently even baby oil works well. This is a purpose-driven anti-rust formula used by hairdressers and barbers for their scissors, combs, and razors. A little bit can go a long way. Yes, vinegar is even good for your razor. It's also great at eliminating any mineral build-up on the razor over time. Gotta love the stuff! Some people like to dip the blade in alcohol to get the water off, then dip it in oil to protect the razor against the elements between shaves. This razor trick works likely as a function of being an effective way to dry the blade. But from my research, users are very happy using this technique, and have made a disposable razor last up to a year, so there may be some additional benefits to this strategy. Simply run the razor along the entire leg of an old pair of jeans 20 times in each direction. Apparently the cross-fibers of the jeans do a bang-up job of either drying and/or sharpening the blades to keep them pristine. In lieu of using shaving cream, some people find that using a shaving soap and nice brush is more luxurious and helps get a better shave. A block of shaving soap can go a very (very) long way too. Hair conditioner is a great lubricant, and is has the added benefit of softening your hair. The razor then won't have to work as hard to cut your hair, making it last longer (the razor, that is). To take the above theory to the next level, you can apply a moisturizer or conditioner a few minutes prior to shaving. Also, after you apply your shaving soap/gel/cream, leave it on for a few minutes before shaving to allow further softening time. The last step in this money-saving razor-longevity equation is in how to effectively store your razor. Since water is the antithesis of all things sharp in the razor world, your bathroom — being the most humid room in the house — is not a good place to store your razor. If you must, keep it in a resealable bag inside a closed drawer or cabinet. Or, simply keep the razor in a drier room of the house. If you want to start soaking or coating your razor, you'll quickly find that the gimmicky razors with "moisturizing strips" and other such add-ons won't be necessary, and in fact will hinder your razor-life-extending experience. So go on — buy a cheap razor, and see how long it lasts. I'm gunning for a year myself between razor blade changes. With my last pack of offbrand Gillette Atra cartridges running out soon (8 left!) I've been planning my next shaving move. I ended up deciding that I'll go with a safety razor since it'll save money in the long run, and finding offbrand Atra blades is getting more difficult each year. By extending the life of my razor blades, I'll be able to stretch my money farther, but saving by switching razors will help too. If anyone is interested, you can check out my estimations here (Atra vs. Safety razor vs. Straight razor). Saving money was one motivation for me when I switched from the latest Gillette cartridge blades to an old-fashioned safety razor. Fusion cartridges can cost $2.50 or more per cartridge. Quality double-edged safety blades can cost as little as 15 cents per blade. I have heard that disposable blades are good for 4-7 shaves. If I change them out once a week, switching saves me about $120 a year. I can spend $15 for a hundred blades and not worry about running out or using a dull blade. Eventually, I decided to do away with the canned gels and go with a shaving brush, oil, and cream setup. The oil goes on before you shave to protect your face against the blade. But a 2 oz. bottle of shaving oil at The Art of Shaving website costs $22. Now I make my own oil with two parts castor oil and one part olive oil. This also saves me quite a bit of money. I second Scott. Warm shower, exfoliate face with loofa, apply a a few drops oil (2/3 castor oil, 1/3 olive oil) on face, and then generic foam cream , close shave, no nicks! Cleanup on my personna 5 blade is following: pump soap squirt and wash. alcohol or hydrogen peroxide to kill germs, careful blot dry with towel. Store away from bathroom moisture. Each blade lasts 3 months minimum! The tips about razor are very helpful for me. I been using the power Gillette fusion for years now. I just bought a 2nd one to add one to my travel bag. This is the best razor I have ever used. From using the Mach3, this is a big improvement. I shave everyday, and not only my face I shave my head with this razor also, everyday. The blades do last, I get 3 weeks easy on a blade. I can get a 4th week and usually do, however notice it getting dull and harder to shave. The power does help, some people say it dont....maybe not a whole lot, but heck a battery will last me a year on this razor. Having sensitive skin, I cant get a super close shave and I am not looking for one. This does the job well with one pass, and never has cut me to date. Member of Amazon Coupons Club. I have been using a safety razor with shaving soap and a brush for about a year now. I love it! It's cost effective,does a better job and lets face it... there is something nice about shaving the way Roosevelt and JFK did it. I'm part African American and thus, have to shave quite often. Because of how frequently I have to shave, I find the fancier razors to be less of a hassle. I use the intuition razor because then I don't have to mess around with shave gels or creams and I can get a good shave without much time or hassle in the comfort of my shower. Sure they're terribly expensive, but good time-savers really pay for themselves in the long run. I was a bit shocked by some assertions (a blade lasting for a year?!?!) until I saw it was Nora posting this one. I switched to a double-edged safety razor about two years ago. The quality of the shave is comparable to a Gillette fusion, according to my wife and daughters. With a $25 investment in blades, and $6 for a Gillette Superspeed on Ebay, I have been shaving for two years, and still have a lot of blades left. That being said, you really can't let your attention wander using a safety razor, if you want a blood free shave. So I don't think this frugality measure really applies to anyone that is going to shave legs or armpits. Getting your whiskers to soak up some water (hot towels, hot bath, hot showers all do the trick) will soften them and make them expand, making them easier to shave closer. Some sort of lubricant does help, both with reducing friction between the blade and the skin, and with conditioning the skin. That being said, too slippery, and the blade slides off my whiskers, which could be used to scrub pots. The biggest offenders in dulling your blade are the salt and oils from your skin. That's why a soak in something that dissolves or dilutes your skin oils lengthen blade life. I did see a commercial recently, with Joey Lagano, race car driver, his statement was when the small blue strip at the top of the blade on the gillette fusion turns white, its time to replace the blade. I often use hair conditioner to shave with. It works well and leaves my skin very soft. Though it plugs up the razor really fast, so you will need to keep rinsing the razor when you use this. I haven't paid for razors in ages. They have been putting out high value coupons on them so much lately that I have a nice stockpile going. Any tips on where to find these coupons? Sounds like misery, but it's not. It takes me literally a minute or less, and I flick the razor downwards on the edge of the sink. It clears in two or three pops, and I never wet my razor. The dry cuttings are easy to clean up, and I've been doing it for 25 years, ever since I started. Only time I've ever cut myself was when a girlfriend insisted I use foam. Sliced myself pretty badly! Dry keeps the razor cleaner, and a disposable 2-3 blade is a quarter or so, I'm getting a month or two per razor. When it starts to drag badly, or cut poorly, I know to change it. Had one last 3 months, but I kinda pushed it. $.25-.50 per month to shave? I'm worth it! I like this one though I haven't tried it. Used a cut throat razor for years for the challenge and artistry. Now I use a simple twin blade with a quick smear of soap. Can't understand why anyone needs shaving cream. Wimps? I've dry shaved before. It works great the first time, when the razor is brand new. For me, it makes the razor dull way too quickly. I can only get 2, maybe 3 shaves out of a razor (Gillette Atra cartridges). Wet shaving I can 5-7 shaves out of a razor. I've tried this a few times, and it kills my razors stupid fast, also the really thick chin and neck hairs don't cut nearly as well, and may not cut fully the 2nd or 3rd day. I tried this method because I was broke and needed to stay clean shaven. Later I tried it out when I was trying to limit the products I use, I use very few now, but 0 is not a feasible option if I wish to remain clean shaven. By the way, baby oil is mineral oil, read the label. The only difference is the added fragrance. Tried the dry shave method and found it irritated my skin too much. Tried the coupons for cheap/free Schick's and found that they plug up between blades too easy if I don't shave every day and are much more difficult to clean than Gillette Fusion or Mach3. In 25 years of shaving I have tried a lot of methods, currently my prefered method is Gillette Fusion with Arbonne RE9 shave gel. I shave in a hot shower using long strokes with the grain and then immediately reverse back up the same strip against the grain. This gets me a super close shave until long after the blue stripe is gone. My wife is convinced the baby smooth skin on the first day is worth the $0.16/shave. This close a shave usually lets me go 2-3 days before my next one. I replace my Fusion blades at about 8 months (about 100 shaves) when the white stripe is almost worn off in some spots. I rinse and shake dry my blades, leaving the in the bathroom without any other treatment in a fairly dry climate. I posted nearly this exact thing. Shower shave, 2 passes (with then against), Edge Gel, but then I just rinse the razor and leave it in the shower...works for 3 months ( could go longer) with 3x shaves/week. Shave every other day/ skip weekends. That's fine but eventually you have to shave your beard round the edges, unless you want to look like you're the Missing Link. After shaving, I rinse my Fusion and then spray it with Clean shower or another spray on shower cleanser. Wait a minute and then rinse with water and store in the medicine cabinet. Best mileage I've gotten is 9 months from one blade. about 20 years ago I began shaving in the shower each morning. I used GE's silicon adhesive to attached a 5x7 mirror to the shower wall and have never preferred anything else. The sink is not full of whiskers and soap scum, my face is completely rinsed without water all over the vanity. It is much faster since you can rinse your razor quickly with the shower stream and you can do final rinse in two seconds. The mirror does steam up but a handfull of water takes care of that. Once a year I wipe the mirror with RainEx and that makes the water run off nicely. OK I buy this one but I have been taking exclusively cold showers for 15 years now and shaving in it might be a bit tough in mid-winter. If you don't need a perfect shave an electric shaver works pretty well. I've purchased two over 8 years at under a $100 each. The second one is still going strong. Wow i did not know any of these tips. Will definitely keep my razor blades even longer now. Oh, I beg to differ on shaving cream being for wimps! This is a woman's perspective: My hubby, who is in construction and by no means a wimp uses shave cream. Mostly he uses it is because I find there is nothing sexier than watching him lather up and shave. The smell of his face after is another turn-on. So, no it is not for wimps, it can be though for men to please their women! I buy the shave cream, and always get him one with skin conditioners. He works outside paving roads, and I have to say at 51 his skin is just as smooth as the day we met 28 years ago! I tried the oil submersion trick, and it was awful--dragging oil all over my skin each morning was a greasy mess. I'm using alcohol now, and am much happier. Another possibility is to switch to double-edged blades: they run as low as 9¢ per blade (and that's for an excellent blade), and a blade lasts about a week. As a bonus, traditional shaving is enjoyable: a pleasure rather than a chore. Do a search on "gourmet shaving" for more info. Introductory book at gourmetshaving.com. You don't need a brush to use shaving soap. Rub it on your beard. No fuss. No foamy mess. One small shaving soap bar lasts for a couple of months. +1 on the safety razor and traditional soap/cream, brush set-up. It is easier on the face and if you can avoid the various acquisition disorders it can be cost effective as well. Pick-up a vintage (read "cheap") Gillette and away you go. I use a mach3 and dry shave. Its a lot quicker and saves on blades. I replace the blades rarely, but I also don't have that thick of facial hair. It seems like when you shave with cream you can be a lot less particular with the angles and positions of your blade strokes. But once you get your dry shaving technique down it makes no difference. "Mineral Oil – This seems to be one of the most effective oils to use, as it is also good for your skin." Mineral oil good for your skin? Actually, it's rather the complete opposite. A number of studies have shown how bad mineral oils is for your skin - not to talk about environmental issues, as it's a petroleum product. It has been linked to arthritis, cancer, irritation and bioaccumulation. A great natural alternative is Jojoba oil - it is actually a liquid wax that will not go rancid. @Mu - Thank you for the education about mineral oil - I didn't know! I'm sure Jojoba oil would be a fantastic alternative; have you tried it? And thank you other commenters, for your great ideas and sharing your experiences. Please keep your best practices and tips coming! @vik - your point makes loads of sense, since acid is a corrosive agent. Thanks for the input! I use several of the tips provided - dry, coat with baby oil, and store away from moisture between shaves. Following these steps really does make a difference. I also use a device that helps speed up the process, and makes it more convenient for me - the EverAfterShave razor protector. Today is Day 131 with the same razor blade, still sharp and shaving great. I think that your goal of one year with the same blade is achievable! So glad somone posted on the negative aspects of mineral oil -- I've read research saying it also does something (depletes? blocks production of?) to vitamin D, osrry, don't remember the cite, so I haven't used any skin product with mineral oil in it for years. Glycerin is much better...unless someone knows a reason against it, as well? Frankly, I use almond oil. I switched a few years ago to a safety (double-sided) razor without regret. I invested quite a bit up front (Merkur Futur razor set for home and a Merkur HD Classic - barber pole - razor for my Dopp kit) and exclusively use products from Nancy Boy http://www.nancyboy.com/ (Signature shave cream, Ultramarine night cream or replenishing facial moisturizer and facial toner) - its really worth the price and lasts a long time. You can get a good deal on Merkur replacement blades on Amazon. I know I saved quite a bit by switching; I even noticed that I change blades less frequently, about every 45 days. I get an excellent shave and I no longer have frequent skin problems. Even purchasing the old 5-blade packs from Costco was expensive ($45 for six cartridge sets?) vs. pennies per safety blade. I also take a bit more time now shaving but it really is more relaxing. The badger hair brush does the trick with working up a good lather and conditioning the skin/whiskers for a shave. Leisureguy is right. When using a double edge Merkur razor, you only get to change the blade like after 10 shaves. Others use the same blade 50 times! Can you imagine how much you save when shaving with a Merkur razor?! Wet-shaving also means less waste. Just think about all the non-recycleable plastic that goes into multi-blade cartridges and handles, and the aerosol cans that release harmful by-products into the environment. Switching to old-style shaving props won’t gain you entry into Green Peace by itself, but it is a good start. FYI: Baby oil is mineral oil with fragrance. Mineral oil is derived from coal. Mineral spirits are the distillate of coal. So, pretty much all mineral oils, spirits, and baby oils are petroleum distillates, and not natural oils. It's not healthy to use the same razor all of the time. So, if you want to go cheap, stubble or beard. Also, if you look around after the hollidays are over, you can usually find stocking stuffer razor refills for 1/2 off or more. So, at that point buy all of them you can get and two handles. This is what I do, and I should be good for the next 2 years already. I love the Every Man Jack shaving cream; great shave, very smooth, economical once you learn not to use too much. Will never go back to a gel. Can be found at Target and no, I don't work for them. Also order Sensor Excel (works great) in bulk from Razorsdirect.com. Can't stomach paying more than $1.50 for a new blade as I love changing blades every week. Shave right after showering, don't dry your face. No shaving cream/gel/soap needed. I use a Merkur double-edge safety razor and bought a huge pack of blades on Amazon. The blades last a week or so, I don't have a really thick beard though. I grew up watching my father shave with Gillette Blue Blades with a razor that he assembled before each use and after each shave disassembled, dried and placed in a case made for the parts. Those blades were not stainless steel, were individually wrapped in paper, and were used only once because they became dull after one use. Gillette had no incentive to improve that until after World War II when a British sword manufacturer began marketing a stainless steel blade. As a father's day gift I gave him a double edge razor that opened with a twist of the handle. The first stainless steel blades were not coated. The coated ones were just as sharp but were more comfortable to use. I continued using my double edge twist handle razor until I no longer could find coated double edge blades. Then I switched to generic disposable single-blade plastic-handle razors. I found those gave as good and comfortable shave as I used to get with the coated double edged, and lasted long enough to be economical. There are probably a dozen web sites that have great double edged blades for sale, from probably a dozen different makers of the blades. While traditional razors may not be common in this country anymore, the rest of the world has not jumped on the cartridge/disposable razor band wagon. I like the coated stainless-steel blades that Lord makes in Egypt. The Feather blades from Japan are even sharper, which I find makes them last fewer shaves. Still, at less than a quarter a blade in quantity, one can afford to change them after only two shaves. I've use to use a Gillette Mach 3 razor every week. I got tired of spending all that money and really wasn't getting that great of a shave. So after doing a bit of research I did two things, first I got an EverBlade - which is awsome! It keeps my blade sharp for 4 months now and shaving with a sharp blade is truly a joy. Also I switched to using a shaving brush - this has made all the difference in the world to me. Highly recommend them both! Get an EverBlade and good brush! I agree with much of this article but I must say that hair conditioners, while leaving the hair and skin soft...and not helping you shave. You are actually STRENGTHENING the cuticle of the hair by applying conditioner...this is the PURPOSE of a hair conditioner, no? Why would you want to make STRONGER hairs for you to then CUT OFF!? Stick with the shave soap, and use a HOT TOWEL application for at least 1 minute up to 3 minutes to really damage the cuticle and let the hair stand up from the skin. I'm suprised olive oil isn't mentioned. I dip the razor in a small amount of olive oil, it works great. I also recommend shaving using olive oil, give it a try. Man I'm glad I found this. Buying razor blades will put me in the poor house. Any WWII veteran, physicist, or someone who lived through the great depression knows the answer to this one. Use as much hot water on your face as you want. This makes the bristles stand up for a closer shave so that's good but never rinse a razor blade in any water that is not as cold as it can possibly be. When rinsing the blade in warm/hot water the blade undergoes expansion followed by a contraction back to its normal size as the blade goes from hot back to normal temperature again. This makes the edge dull perhaps because the hot water softens the metal. When rinsing with only cold water the blade goes in the other direction by contraction first and then expansion back to its normal size as the temperature goes from cold back to normal temperature again. This does not dull the edge. With blades these days it is even worse. Hot or even warm water will soften the polymer coating on the blade. Then when the blade expands because of the warm or hot water the polymer stretches. When it contracts again not only is the edge dull but the polymer is all wrinkled up which effectively makes the blade seem even more dull. This happens pretty much instantly and is great for companies who manufacture razor blades because the consumer has to replace the blade sooner. To test this, lather and shave only half your face with a new razor (be sure to always rinse it in very cold water). When finished this side of your face, rinse the razor several times while changing the temperature of the water from hot to cold. Now lather and shave the other side of your face. If you do not immediately notice that the blade is now more dull you will for sure notice the next time you use the razor. Mine usually last until the wife takes them in the shower. I have had some blades stay perfectly sharp for at least a few years of daily shaving. As for the temperature of the water that you use on your face that is a personal preference but if you want your blades to last considerably longer they must never touch anything other than cold water. Even if these tactics work as described, they are all pointless and stupid. The point at which a razor is no longer useful is when repeated usage has dulled the blade. If you are using a single razor long enough where rust/oxidation has dulled it, or you are so bad at hygenics that bacterial accumulation has ruined your blade, you are clearly an idiot in regards to proper usage of hair razors. Only honing will restore a dull blade to sharpness. No liquid immersion can accomplish this. And if you are worried about infection from your blade, then your blade must be extremely dull in the first place, as infection isn't an issue unless you are cutting the heck out of your skin. Replace your blades when dull, and if you're unsatisfied, send an email to your blade company that their blades dull to quick. None of the examples given here do anything useful, and even if they might, they are more expensive in the long term than just buying a new blade. I use Schick Hydro 5 razors and was using 1 per shave. You could also save while shaving with a monthly subscription from Razor Blade Club. You'll get great razors mailed to you each month. That's easy because you go to your mailbox anyways. And the cost is cheap enough that you can change out a razor blade cartridge each week. Which means you always are using a sharp clean blade for a good close shave. You also save on toilet paper costs because you no longer have to tear off pieces in the morning to stop the bleeding from those nicks created from that dull razor blade you were using because it was too expensive to throw away and you just don't want to go to the store to get more and spend big cash. These tips actually work pretty well. I wouldn't use a razor much longer than a couple weeks though because I prefer the aloe strip to still be working. Another good tip, don't buy blades at the store. I use Harry's Razors. They are classy and less than half the price of blades in stores. Buying online combined with these tips will save you some serious doe. Baby oil IS mineral oil, so of course it works just as well. And it's also the cheapest of all the oils listed. I shave in the shower the the Fusion Vibrating razor. I shave 3 times/week. I don't bother drying the razor, since it sits in the show and get wet all the time. The blades last about 3 months. I change them at that time, dull or not (usually dull). I also use Edge gel. I have used hair conditioner a time or two and it works fine as well. I think that being in the shower with the hot water helps soften the beard a little, extending the useful life of the blade. On the days that I do shave, I shampoo first, in order to give my beard a little time to "warm up" - soften - from the steam and hot water. I make two passes on my face, first, down, with the grain, to get the longer bits off, then against the grain to get that baby smooth skin. If I only make one pass, the beard is noticeably longer on the 2nd day and I feel like I need to shave again. I have been shaving with the Fusion for about a year now. Prior to that I always used electric. After hearing all of your suggestions (don't get me wrong - they are good - just time extensive) I think I have decided to go back to electric!